Specialty CME Credits: Included as part of the 4 credits, this CME activity is eligible for 4 Behavioral Health CME and 1 Pharmacology CME credits, subject to your state and institutional approval. Research Track Fellow, Child & Adolescent Psychiatry, Zucker Hillside Hospital, Donald and Barbara Zucker School of Medicine at Hofstra/Northwell Health, New Hyde Park, NY. Behavioral health emergencies most commonly present as depression, suicidal behavior, aggression, and severe disorganization. 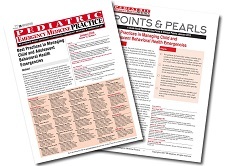 Emergency clinicians should avoid relying solely on past medical history or previous psychiatric diagnoses that might prematurely rule out medical pathologies. Treatments for behavioral health emergencies consist of de-escalation interventions aimed at preventing agitation, aggression, and harm. 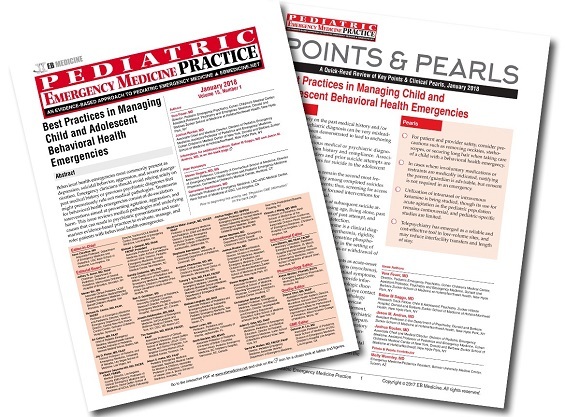 This issue reviews medical pathologies and underlying causes that can result in psychiatric presentations and summarizes evidence-based practices to evaluate, manage, and refer patients with behavioral health emergencies. A 15-year-old adolescent boy is brought to the ED by police because he threatened his mother with a knife. The police report states that he “trashed the house.” The patient’s mother arrives in the ED and states that their argument started because she would not allow her son to go out with a group of older friends whom she believes are a bad influence. She reports that her son has been abusing “oxy” that was initially prescribed following a football-related back injury. Since the injury, depression and truancy have been significant problems. The patient’s family history is concerning for both depression and substance abuse. When you evaluate the patient, he is diaphoretic and his pupils are dilated. Initially, he is cooperative and admits that he wants to “stop using the pills.” He adds that he has had transient thoughts of suicide but has never made a plan or attempted suicide. As you continue questioning the patient, his behavior begins to escalate and, despite redirection, he starts yelling. What should you do to ensure the safety of this patient and the ED staff? How should you respond if the patient’s aggressive behavior escalates further?